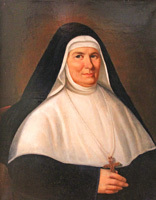 Jun 30 is the anniversary of the death in 1858 of Jeanne-Marie Chavoin, foundress of the Marist Sisters. 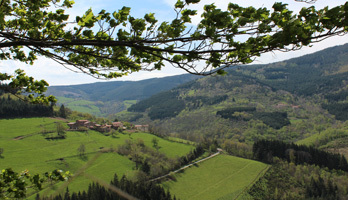 Above: Painting of Jeanne-Marie Chavoin, Belley, France / the former convent of Jarnosse, where J-M Chavoin died. 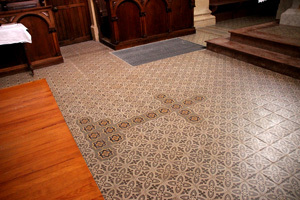 Below: A tiled cross in the sanctuary of the Jarnosse parish church marks the orignal resting place of Jeanne-Marie Chavoin / Marist Sisters' display nearby | Frs Tito Muavesi and 'Aisake Silatolu in the cellar of the Chavoin home at Coutouvre, where once clandestine Masses were celebrated during Revolution times / Jeanne-Marie Chavoin (top left) in the church of Coutouvre. From Rome Fr Lote Raiwalui SM is visiting the Australian Province between local chapters (Australia and NZ) and regional meetings. 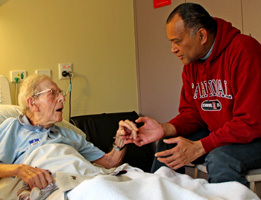 Fijian-born Fr Lote has made special point of calling on retired confrères including those in nursing care. Vinaka, Fr Lote! 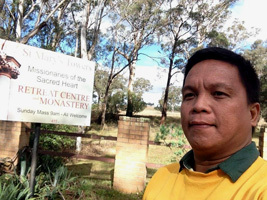 As the recent provincial chapter voted in favour of a new province of 'South Pacific- Asia', Australian Marists were happy to host three guests from the region: Frs Chris Ganzon and Kevin Medilo (Marist Asia District) and Fr Kevin Conroy (NZ). 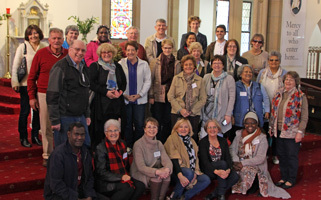 Above: Frs Chris Ganzon and Kevin Medilo at Villa Maria / Fr Kevin Conroy with the Marist Sisters at Woolwich, and in Sydney as part of familiarisation with Marist inner-city church ministry. Below: Fr Kevin Medilo was Asia's observer in the recent provincial chapter / Frs Kevin Medilo, David Kennerley (provincial, NZ), Chris Ganzon and Kevin Conroy at Morning Prayer, Villa Maria, during the meeting of Marist Asia-Pacific leaders. 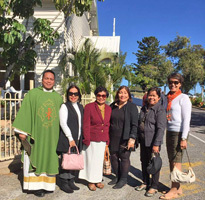 Further below: Fr Chris took the opportunity for annual retreat whilst in Australia... and to visit the Filipino community in Gladstone, Qld before leaving for the international formators' gathering at La Neylière, France. 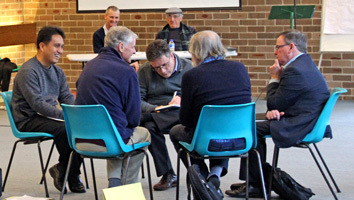 The Provincial Chapter of the Australian Marist Fathers concluded on Jun 23 after approving statements on Finance, Ageing, Professional Standards and Vocations - Formation, and a vote join a new combined province with the Province of New Zealand and the District of Asia. Frs Tony Kennedy and Peter McMurrich were elected as delegates to the 2017 General Chapter. 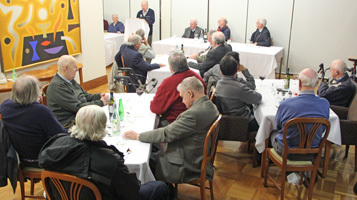 Eight Marist priests of the Australian Province were honoured at Hunters Hill on Jun 22 recalling their priestly ordination, 60, 40 and 25 years ago. Fifty local and visiting confrères joined in a celebratory dinner at 'Montbel' following Mass in nearby Holy Name of Mary church. Jul 23 marks the 200th anniversary of the pledge to form the Society of Mary taken by Marist aspirants at the shrine of Mary, Fourvière, France, in 1816. 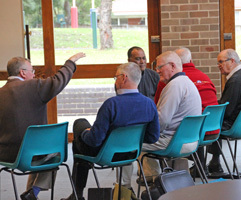 The provincial chapter of the Marist Fathers in Australia has commenced at Hunters Hill, NSW. 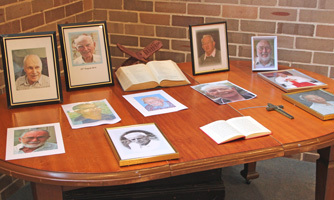 Below: Small group sessions | Memorial to the Marists who have died since the last chapter. 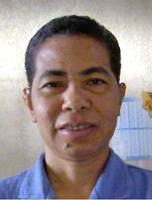 The Marist Missionary Sisters of the Asia-Pacific region have a new leader and council to take office in early July. 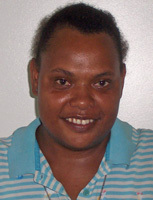 Australian Sr Jennifer Clarke has been appointed regional leader for a three year term with councillors Sr Jennifer Laku (Solomons, currently in Bougainville), Sr Marie Claire Rambeloharinirina (Madagascar, currently in New Caledonia) and Sr Janice Ruff (Sydney). 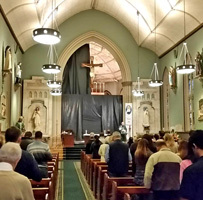 Interior renovations have begun at Sydney's inner-city shrine of St Patricks, Church Hill. 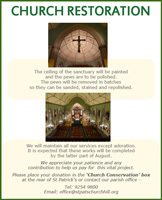 Work will include re-painting of the sanctuary ceiling and re-polishing of pews and is expected to be finished in late August. 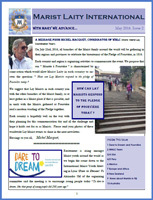 Click here for the latest newsletter of Marist Laity Australia. 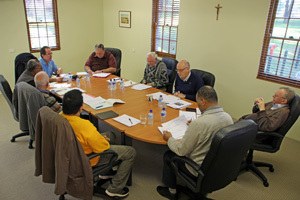 Leaders from the Marist Fathers' units of Asia, Australia, NZ and Oceania are meeting in Sydney this week. 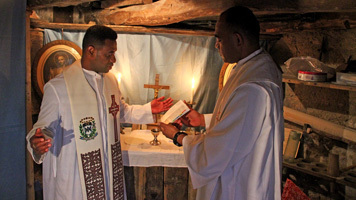 This year's gathering, at Hunters Hill NSW, coincides with the visit of Assistant-General, Fr Lote Raiwalui SM, who will attend the forthcoming provincial chapters in Australia and New Zealand. MAP's sessions include updates from each unit and sharings on vocations, re-structuring, social media and ongoing formation. 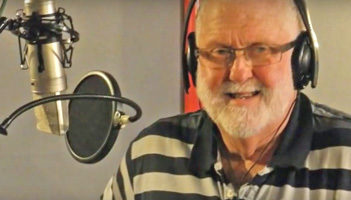 The Bicentenary of the 1816 pledge to form the Society of Mary will be marked with a new song from Australian Marist, Fr Kevin Bates SM. 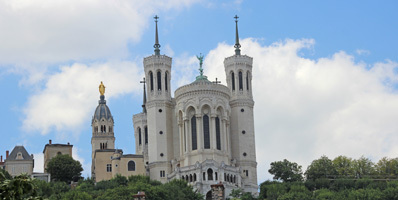 The song, 'More than Memories', will be part of the celebrations to take place in the basilica of Fourvière, Lyon, France, on Jul 23. amd which will be live-streamed. 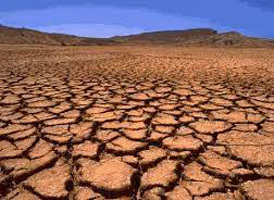 Click here for the song. 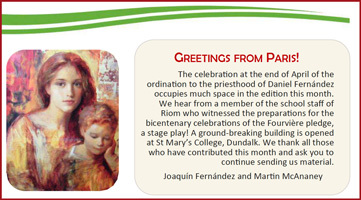 Click here for the latest news of Marist Laity happenings worldwide. 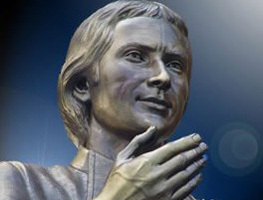 Jun 06 marks the anniversary of the death of St Marcellin Champagnat, founder of the Marist Brothers, and one of the pioneer Marist aspirants establishing the Society of Mary. Happy Feast Day to all our Marist Brothers! Above: St Marcellin Champagnat / room at his birthplace, Rozey, France. 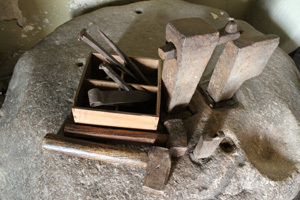 Below: Nail-making equipment used by Fr Marcellin and the early brothers / community table at the first community of brothers at La Valla | La Valla countryside, Fr Marcellin's first parish / The Hermitage. built by Fr Marcellin and his brothers. 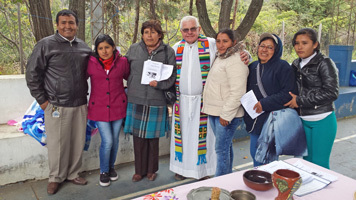 Fr Hoppy has worked tirelessly in establishing networks of Basic Christian Communities (CEBs) throughout Bolivia, and has sent photos of recent CEB activities. 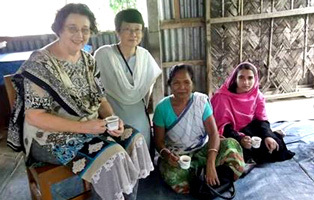 National leader of Marist Laity in New Zealand, Mrs Bev McDonald, was a participant in the recent Marist Journey of Mercy experience. 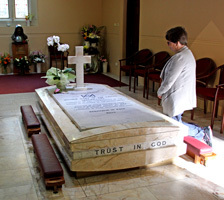 Staying with the Marist Sisters at Woolwich, NSW, Bev spent some extra days in Sydney to visit the shrine of Saint Mary of the Cross MacKillop. As well as having the grave of Saint Mary MacKillop the North Sydney centre features an impressive museum. 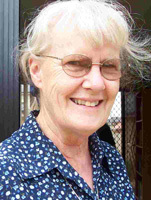 Bev noted the Marist connections especially through the early experiences of Josephite co-founder, Rev Julian Tenison Woods.